No shock to any of my regular readers – I pretty much want to ferment all the things, all the time. I’m basically a jewel case away from being a Portlandia sketch. 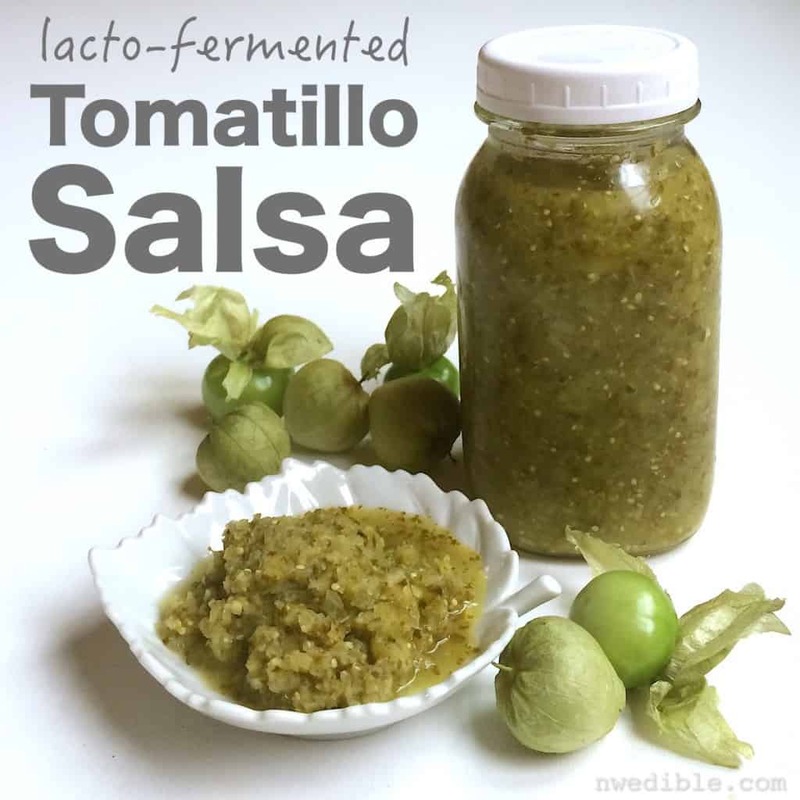 My new favorite fermented condiment is this Lacto-Fermented Tomatillo Salsa. It’s super easy. You just chop up a bunch of stuff in a food processor, mix it up and ferment everything it in a big jar. 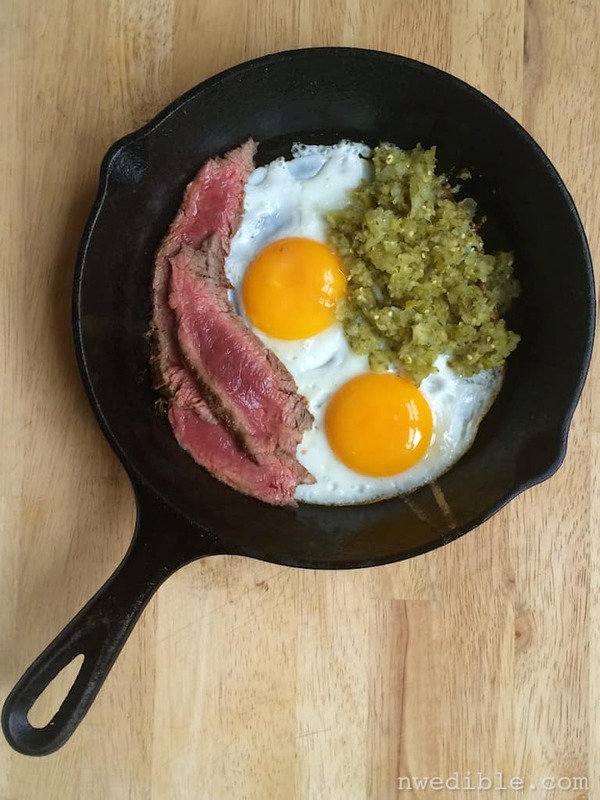 It tastes great on everything, but is particularly delicious with eggs or steak. Or, you know, both. My tomatillos have been going crazy this year, so naturally my mind drifted towards salsa. My go-to on-line starting place for most things canning is the National Center For Home Food Preservation. I made a roasted variation of their water-bath canned Tomatillo Green Salsa, and it was good. Really good, in fact. But when it came time to make batch number two, I had something a bit….livelier in mind. And so, starting with the same basic proportions from the canned tomatillo salsa recipe, I fermented my way to tomatillo salsa heaven. To prepare tomatillos, peel off the husk and wash them to remove any stickiness. Typically this is all that’s needed, but if any stems look woody, trim them off too. I chop all the vegetables for stuff like this in my food processor. Just chop each vegetable individually to the ideal, fine-chopped consistency and then combine them in a big stainless bowl. If you try to chop different vegetables together in the food processor, the softer vegetable inevitably becomes over-processed while the second one is still in big pieces. Clean and prepare a 1 gallon fermentation crock or a 4-liter glass, bail-top jar for fermenting. Make sure it's perfectly clean! Chop the ingredients one at a time in the bowl of a food processor fitted with a metal blade. Combine all the prepared vegetables in a large bowl, and stir to fully mix everything. Add the cumin and salt and 2.5 tablespoons of the salt, and mix to combine. Taste the salsa. It should taste distinctly salty, but not unpleasantly so. If the salsa seems bland, add the remaining half-tablespoon salt. Adjust seasonings as desired. Add the tomatillo salsa to the crock or jar. With a clean spoon, press the ingredients down to release some of the juices. Press the solids under the juices, and weight the ferment. Seal the crock or jar, and leave the tomatillo salsa at room temperature out of direct sun, for 2 to 4 days. Check the ferment daily. Look for bubbles and other signs of fermentation, give the ferment a little shake and swirl to keep everything fermenting evenly, burp the lid to release any pent-up carbon dioxide in the jar and taste the development of the tomatillo salsa (clean spoon please). When you like the taste of the salsa or after 4 days, transfer the fermented salsa to smaller jars for cold storage in the refrigerator, where it will keep for at least 4 months. After fermenting, you'll have about 3 finished quarts of salsa, which can be stored refrigerated in smaller jars. However, I recommend fermenting in a larger container - something about gallon size is right - to allow for sufficient headroom and uniform fermentation. Previous Post: « How Much Salt Should I Use For My Fermentation? Congrats on the upcoming release of your book! I can’t wait to get a copy. Great question! The “lacto” comes from the name of the beneficial bacteria that preserve lacto-fermented foods. These bacteria are called “Lactic Acid Bacteria” – one of their most famous members is Lactobacillus. They make lactic acid when they eat sugars. Thanks for the explanation. I’ll have to read the post you cited. Somehow I missed it, which is strange. I’ve read every post of yours for the past three years at least. Also, thanks for the recipe! My husband was super-excited to hear that this was on my to-do list for the week. Best of luck with all of the book happenings. 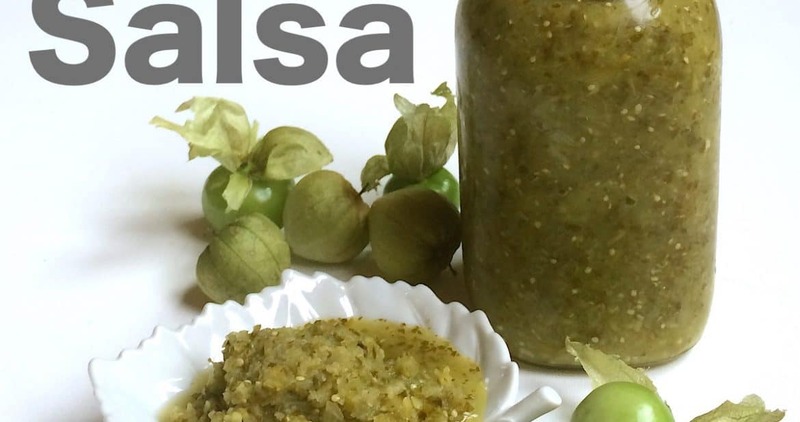 I think you will love this salsa! I sure do! We made it with green tomatoes. Lots of unexpected green tomatoes and appropriate ratio of everything else = 3 gallons of a culinary game changer. Would have never thought to try it without your rave review. What’s next? Awesome Anna! Glad you like it too! I have this fermenting the last 24 hours on my counter. I am having a heck of a time keeping “all” of the little bits down under my weights. How important will this play out over the course of the 4 day ferment? Thank you if you are able to get back to me, otherwise I will just wing it and see what happens. So excited for your book- preordered so many moons ago! That’s not unusual with salsa type ferments – the CO2 that develops during fermentation tends to make everything float. Just do the best you can with a weight. I like something like this, or you can fill a ziplock with brine and that will work very well. Typically, if you have a lid, like a mason jar lid or similar, on the ferment, the CO2 will displace the oxygen and form a “cap” that protects the ferment from oxygen and you’ll be ok, but it’s less reliable than the weight + lid approach. Reminder: any time you lid your ferment, do so loosely and/or “burp” the lid daily to allow the CO2 to escape so pressure doesn’t build up so much that your jar explodes. Thank you for pre-ordering the book! I made this last weekend and it is fantastic! It’s joining my LF pico de gallo in the fridge, and also is now on my seasonal list of things-to-make. Yum! Mine did just great with the bits floating a bit. I have altered my weights to keep it all submerged. I seriously can not get enough of this stuff, it is that good. I figured the one batch would last into the early winter……I will be looking for some more late season tomatillos next week!! After 4 days my salsa had not fermented much, if at all. Now, after about three weeks, it’s fermenting so strongly that it sounds like a just-poured soda. The flavors have mellowed too. I strongly recommend a much longer ferment time.